Defense Secretary Leon Panetta looks as though he is going to be the last person on the planet to realize what a failure US strategy in Afghanistan has become. Today, while visiting New Zealand, he announced that the final surge troops have left Afghanistan, returning troop levels to 68,000 from a high of 101,000 at the peak of the surge President Obama ordered at the end of his first year in office. “As we reflect on this moment, it is an opportunity to recognize that the surge accomplished its objectives of reversing Taliban momentum on the battlefield, and dramatically increased the size and capability of the Afghan National Security Forces,” Mr. Panetta said. However, the level of violence remains higher than it had been before the surge forces came. In the first six months of 2012, for instance, 1,145 civilians were killed, compared with 1,267 in the same period of 2010, when surge forces were only just arriving. The official spoke on condition of anonymity as a matter of military policy. The surge brought American troops to a high of 101,000, along with as many as another 50,000 coalition troops, mostly from NATO countries. Over the past three years, the increase in American troops helped to enable an accelerated training program, the senior American official said, with the Afghan police and army more than doubling in number by this year, to 300,000. But the other thing that stands out in this anonymous statement is an outright lie. The official claims that during the surge, the ANSF “more than” doubled to 300,000. 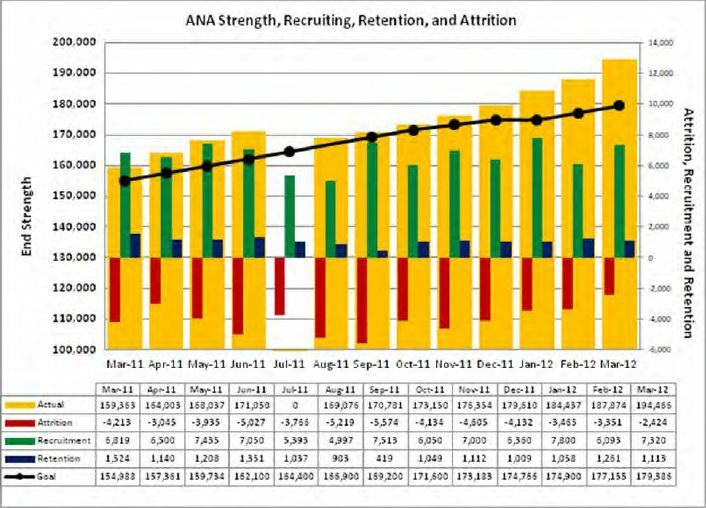 This Brookings publication (pdf) documents force size for the ANA and ANP, and it shows that in December 2009, when Obama ordered the surge, the force size was 195,089. If we use the source’s 300,000 figure for the current size, the current force is only 1.54 times the previous size, not more than twice. Even if we use the 350,000 figure that was used in all previous statements, the ratio only improves to 1.79, still well below twice the original size. The military can lie all it wants, but it still cannot hide its failures in Afghanistan. Hi Jim! I hesitate to ask this because some of my comments lately have in retrospect seemed really dumb…like my brain is shrinking…but is that a typo in the NYT quote about the level of violence? Those numbers seem to indicate that the civilian deaths in early 2010  were indeed somewhat higher than in early 2012 . In other words, the number of civilian deaths [in that case] were fewer after the surge. @harpie: Oops, no, you are right and I mis-read it based on what they were saying. I’ll check and see if they’ve done an edit on the article yet. I’m half expecting them to respond to the fact that ANSF size didn’t double. After checking: no, the 300,000 number and the death rates for civilians remain as quoted in the post. I’ll add a note in the post on the death rates. That’s a great catch about the troop levels statment. It will be interesting to see how/if things change. Moon of Alabama has an issue with the NYT today, as well. @harpie: Thanks for the MofA link. I’m glad b is on that question. It jumped out at me as well, but I didn’t google the question the way he did. Is “ignore reality” newspeak for lying. I am sure Panetta knows the facts aka reality so he is just plain lying. @Jim White: Heh. And now the Times article is longer even though there is no notation that it has been edited. The 300,000 number has magically gone to 350,000, so perhaps that was a simple error on their part. The strange paragraph about higher violence rate but quoting a slightly lower civilian death rate is unchanged. Something something “when their job depends on their not knowing it” yadda yadda. As a former constituent of his, it saddens me to see him descend to paid-shill status. I guess that kind of thing has value in some circles. Some days ago I mentioned that troubles between China and Japan were looking serious with Canon and Panasonic closing most of their factories in China because of the violent protests (the US has a defense treaty with Japan). Secretary Panetta has since said the US is not taking sides but will honor the treaty if it comes to that. As an update, tensions have gotten worse with Japanese auto makers Toyota, Honda, Nissan and others closing or shutting down factories as well. To make matters worse, China is claimed to now be engaging in cyber-warefare against Japan, which as Ms. Emptywheel has noted in her writings is a grave offense. @jerryy: Agree–this is spiraling out of control while no one is watching that closely here. Wow! Now at the same link for the New York Times, the story is very different. Both bits that I quoted in the original post are now gone. Now it seems like a total non-sequiter. But it’s good to have it there. According to these numbers there were 122 fewer deaths in 2012 than in 2010. Sept. 21, 2012 at 4:31 p.m. In the first six months of 2012, the armed conflict in Afghanistan continued to take a devastating toll on civilians. Between 1 January and 30 June 2012, conflict-related violence resulted in 3,099 civilian casualties or 1,145 civilians killed and 1,954 others injured, a 15 percent decrease in overall civilian casualties compared with the same period in 2011 when UNAMA documented 3,654 civilian casualties (1,510 killed and 2,144 injured).19 This reduction of civilian casualties reverses the trend in which civilian casualties had increased steadily over the previous five years. UNAMA remains concerned, however, that the number of civilian deaths and injuries remains at a high level, comparable with 2010, when UNAMA documented 3,268 (1,271 civilian deaths and 1,997 civilian injuries) civilian casualties. So the 2010 number is really 1271 deaths, not the 1267 the Times reported, but is a bit higher than the 1145 killed this year, conflicting with the Times claim that the level was higher post-surge. @Jim White: Thanks for getting those stats, Jim. I find it curious and disconcerting that the Times could make such an error. Most people would just read the words and gloss over the numbers. I probably would have if you hadn’t separated that paragraph out. I haven’t had a chance to check what’s in the print edition. It’s Actually Not about the West Wing–It’s about Rule of ... And What Will MEK Be Doing in Baghdad While Waiting for Resettlement?